Residents clean up after Hurricane Irma heavily damaged the First Baptist Church in Everglades City, Florida, U.S., September 11, 2017. FLORIDA CITY/MARCO ISLAND, Fla. - Florida allowed some residents to return on Tuesday to areas hammered by Hurricane Irma’s high winds and storm surge, while the death toll rose in the second major hurricane to hit the United States this year. Irma, which had rampaged through the Caribbean as one of the most powerful Atlantic hurricanes on record, was downgraded to a tropical depression on Monday. It will likely dissipate from Tuesday evening, the National Hurricane Center said. At its peak the storm prompted evacuation orders for 6.5 million people in Florida, the largest evacuation in modern U.S. history. Irma killed nearly 40 people in the Caribbean and at least six in Florida and Georgia. A local Florida official said there had been more deaths yet to be reported, particularly on the Florida Keys, where Irma arrived as a Category 4 hurricane with sustained winds of up to 130 miles per hour (215 km per hour) on Sunday morning. FEMA was continuing to rescue people stranded by flooding around Jacksonville, in the state’s northeast, he said. Irma devastated several Caribbean islands en route to Florida. It destroyed about one-third of the buildings on the Dutch-ruled portion of St. Martin island, the Dutch Red Cross said on Tuesday. The storm was the second major hurricane to make landfall in the United States in a little more than two weeks when it roared over Key Cudjoe. Hurricane Harvey plowed into Houston late last month, killing about 60 and wreaking some $180 billion in damage, largely through flooding. Monroe County Commissioner Heather Carruthers said on Monday that people had been killed in the Keys, which have nearly 80,000 permanent residents, but she did not have a count on how many. “We are finding some remains,” she said in an interview with CNN. Video footage of the islands showed homes torn apart. Several major airports in Florida that halted passenger operations due to Irma began limited service on Tuesday, including Miami International, one of the busiest U.S. airports. Miami Beach will allow residents to return home from 8 a.m. (1200 GMT), its mayor said. More evacuation orders were likely to be lifted on Tuesday. Monroe County opened road access on Tuesday morning for residents and business owners from Key Largo, the main island at the upper end of the chain, as well as the towns of Tavernier and Islamorada farther to the south, fire officials said. No timetable was given for reopening the remainder of the Keys, which are linked by a series of causeways and bridges down to Key West, a popular tourist spot on the southern tip of Florida. Utilities reported some 6.9 million homes and businesses were without electricity in Florida and neighboring states and said it could take weeks to fully restore service. Between 2,000 and 3,000 utility workers from out of state, sent to inspect and repair power lines, were staying in Broward County in cramped conditions at BB&T Center, home to the National Hockey League’s Florida Panthers, said Gus Beyersdorf, 40, of De Pere, Wisconsin. One man was found dead in his crashed car on the Keys and two law enforcement officers died in a possibly storm-related fatal car crash on Sunday in Orange County, Florida. On Monday, two people were killed by falling trees in two Atlanta suburbs, according to local authorities. A man was found dead in Winter Garden, Florida, after being electrocuted by a downed power line, local police said. The remnants of Irma moved into Alabama on Tuesday and were forecast to head into western Tennessee by Tuesday evening with maximum sustained winds of 25 mph (40 kph). In South Carolina, the Charleston Harbor area saw major flooding on Monday with water about 3 feet (1 meter) above flood stage and minor flooding was forecast for Tuesday, the National Weather Service said. The National Hurricane Center was monitoring another hurricane, Jose, which was spinning in the Atlantic about 700 miles (1,130 km) west of Florida. About 2-1/2 months remain in the Atlantic hurricane season, which starts in June. 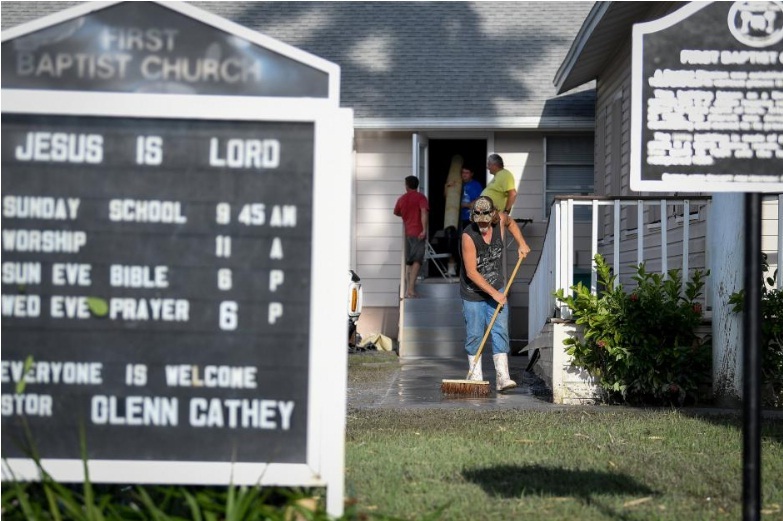 Florida allowed some residents to return on Tuesday to areas hammered by Hurricane Irma’s high winds and storm surge, while the death toll rose in the second major hurricane to hit the United States this year.